Gettysburg Restaurants | Gettysburg Dining Pa.
At General Pickett's Buffet we take pride in our great home cooked food, atmosphere of Southern hospitality, and affordable prices. Whether you are bringing your family, your school, your office, your scout troop, your club or your convention, we can accommodate your party of 2 to 200. Gettysburg Dining - Specializing in bus tours for the past 19 years, the staff of General Pickett's Buffet is trained to give your group the fast, efficent service it needs to keep you on your schedule, and a great tasting variety of food to keep them happy and satisfied. Serving both lunch and dinner buffets, we are open 7 days a week from March thru November and offer seasonal hours in February and December. We offer breakfast for groups of 100 or more - on reservation basis only. For menu and reservation information please visit our website at - www.generalpickettsbuffet.com or call 717-334-7580. You may also Email us at - gpbufft@pickettsbuffet.com - Handicap accessible and parking available. 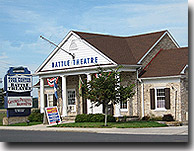 The second story at General Picketts Buffet houses our large Gift Shop and Battle Theatre - a 45 min. film presentation of the overall summation of the Battle of Gettysburg. THE AVENUE RESTAURANT We are so very proud of our friendly, hard working staff (about 35 of us), some family, some friends, all "Great People" with the desire to prepare the best quality food for you and to serve you with our friendly hometown kindness. Serving Breakfast, Lunch & Dinner Daily. We Serve Sunday through Thursday 7am to 8pm and Friday & Saturday 7am to 9pm with Extended Summer and Holiday Hours. 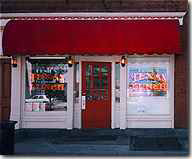 Phone: 717-334-3235 "In 2008 We Celebrated Our 50th Anniversary"! Come join us for a great meal at our Gettysburg Restaurant and enjoy your Gettysburg Dining experience. 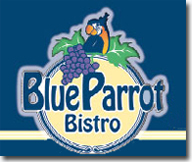 The Farnsworth House is one of the best Gettysburg Restaurants for Dining in Gettysburg Pa.
Blue Parrot Bistro- Located on the site of one of the earliest houses in Gettysburg, The Blue Parrot continues a tradition of hospitality, which began in 1850 with Mrs. Schwartz's Oyster Parlor. And now, what is a Bistro? Is it casual, homey and relaxed or is it a sophisticated eatery? At the Blue Parrot we think both apply. So if you are out for an evening of Gettysburg fine dining or whether you are here for a cheeseburger, a beer or a game of pool, you have come to the right place. Hours: Tues. - Sat. Lunch 11:30 - 2:00 * Tues. - Thurs. Dinner 5:00 - 9:00 * Fri. - Sat. Dinner 5:00 - 9:30 * Closed Sun. Mon. Outdoor Seating Available in Season. HISTORIC FAIRFIELD INN 1757 - The Fairfield Inn, located directly on General Lee´s Confederate Retreat from Gettysburg, July 4, 1863, the Inn is one of a distinguished few in America that has been in continuous operation for 250 years! Listed on the National Register of Historic Places, the Inn is an authentic American Treasure, which was used as an early Colonial Meeting House, a Stagecoach Stop, Confederate Civil War Hospital and was part of the Underground Railroad. Many notable Americans have graced itªs halls. Today guests of the Inn can dine in President & Mrs. Eisenhower´s favorite room, order the same meal Generals Robert E. Lee & J.E.B. Stuart were fed during the infamous Confederate Retreat from Gettysburg, sleep where Statesman Patrick Henry, famous for the quote: "Give me Liberty or Give Me Death" conducted meetings or where General J.E.B. Stuart stayed during his Confederate Raid of the valley, view the hiding spot for the fleeing slaves & the original Maria Furnace invented by Thaddeus Stevens when he resided at the Inn, or relax in the Tavern where baseball Hall of Famer, Eddie Plank, enjoyed a good ale. The on-site Tavern holds the oldest liquor liscence in the Gettysburg area and county! Guests can take the Inn´s History & Underground Railroad tour for FREE. To compliment the fine Dining accommodations, the Mansion House Gettysburg Restaurant and Squire Miller´s Tavern serving a wide selection of classically prepared and artistically presented dishes. The hotel´s two chefs and their team offer an imaginative menu of grilled and roasted game, pastas, seafood and mouth-watering steaks. Ask for General Lee´s "Bill of Fare" and dine on the same meal, taken from the original recipes, he and his officers were served on July 4, 1863. Check out the website for Feasts and Special Event Dinners, Savor Get-A-Way Packages & Romantic Fling Packages - Web: www.thefairfieldinn.com, E-mail: InnKeeper, Tel: 717 642 5410. DAVE and JANES CRAB HOUSE - Naaa ! Welcome to the 1863 Restaurant- The Gettysburg 1863 Restaurant is a "family-friendly", unique, casual or fine dining restaurant that offers a wide range of appetizers, steaks, salads, sandwiches and desserts plus a few playful twists on old classics. Open for breakfast, lunch and dinner. Menu favorites include: steaks, jumbo lump crab cake, tuna tini, mediterranean caesar salad & chicken bruschetta. Don't miss our daily lunch & dinner specials. All local residents receive a 10% food discount at 1863 Restaurant. All day and every day! THE HISTORIC CASHTOWN INN Tucked away along the scenic Lincoln Highway, the Cashtown Inn was built circa 1797 and is one of the Gettysburg Area's oldest and most reputable culinary establishments. The Cashtown Inn served as Confederate Headquarters of Gen. A.P. Hill prior to the Battle of Gettysburg while the 22,000 men of his Third Corp camped throughout the town. Following the Battle, Gen. John Imboden used the Inn as a hospital and as his headquarters to organize the evacuation of wounded Confederate troops from the area. Historians agree the Cashtown Inn is the most significant Confederate house north of Richmond! Today the Cashtown Inn serves as a relaxing Bed & Breakfast and houses one of the best Gettysburg Dining Restaurants with a full service Tavern. The restaurant offers a New American menu that can be enjoyed in the original Tavern Room (circa 1797) or the newly appointed Victorian Dining Room. Fresh, local and innovative ingredients and flavors are simply and expertly prepared from scratch in our kitchen for the area´s best dining experience. PING´S CAFE! Gettysburg Restaurants At Ping´s we specialize in authentic Chinese and Japanese Cuisine. Our food is always freshly made, delicious and healthy! Sushi lover, check out our Sushi Bar. We have en extensive menu of Sushi Nigiri or Sashimi. Fried Rice, Lo Mein, Moo Shu, Vegtables, Combo Platters, Soups, Seafood, Poultry, Beef, Pork, Rolls OR Hand Rolls or try one of our SPECIALTY ENTREES...PEACH WALNUT CHICKEN OR SPICY MANGO SHRIMP! If you are adventurous, we suggest you try a special kind of fruit called "LONGAN". Translated to English it means DRAGON EYE BALLS! It has a refreshing sweet taste like pear but a different texture. Group menus available, Party reservations and Celebration/Gatherings welcome. 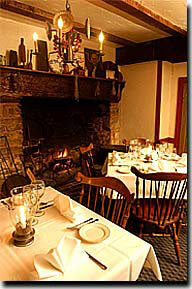 Come to our Gettysburg Restaurant for the best Gettysburg Dining experience on your visit. WE DELIVER MINIMUM ORDER $10 (limited area). ERNIE'S TEXAS LUNCH - Since the early thirties, very little about "Ernie´s" Gettysburg Dining has changed. From the grill in the front window to the "family" table in back, the layout of the dining area remains as is was over 60 years ago. With this in mind, owner Ernie Kranias has remodeled the Restaurant to bring back the look and feel of a 1930's diner. Come visit our Gettysburg Restaurants. Your Gettysburg Dining experience is our primary focus. Open Monday through Saturday from 6:00 AM to 7:30 PM, 8:30 PM on Fridays, andclosed Sundays, "Ernie´s" offers a completebreakfast, lunch and dinner menu, andthe famous Texas Hot Weiner. "Ernie´s" is a living piece of Gettysburg history you must visit. 58 Chambersburg St.
Ragged Edge Coffee House with 3 locations in Gettysburg call (717) 334-4464 - Gettysburg Restaurants, Dining, Coffee House. Gettysburg Eddie's Restaurants Dining (717) 334-1100 - Great Gettysburg Restaurants ! Gettysburg Family Restaurants Dining (717) 337-2700 - Feed The Whole Family, delicious food. Old Eagle Grill (717) 338-9200 - Gettysburg Restaurant with Excellent Service and Food. McClellan's Tavern (717) 337-2000 - Gettysburg Restaurants in The Gettysburg Hotel.